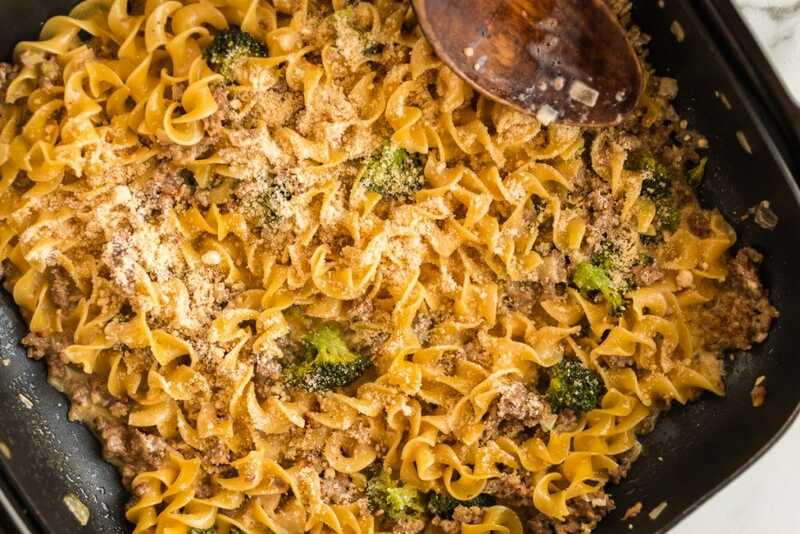 Creamy sausage and broccoli pasta – a one pot meal. What’s not to love about only having to wash one pot after dinner? I don’t know about you, but if I can save time in the kitchen, I am all in! 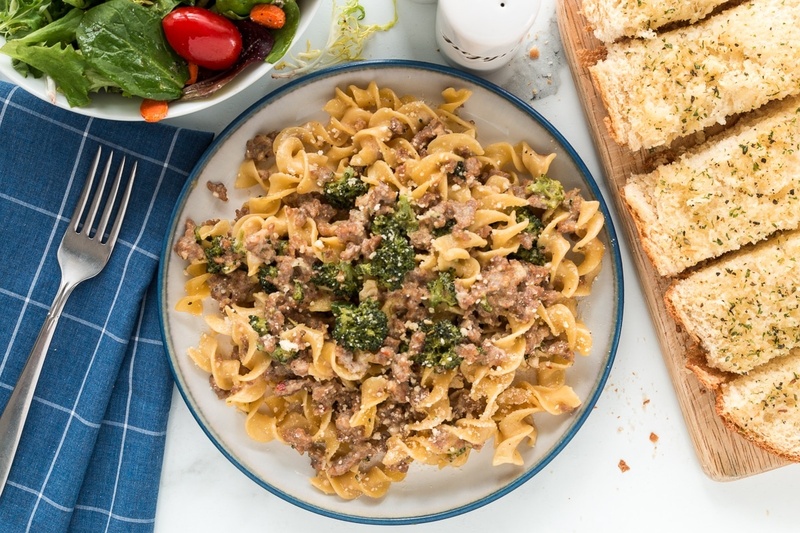 This creamy sausage and broccoli pasta is not only delicious, but is the ultimate one pot meal because it can all be prepped ahead of time! 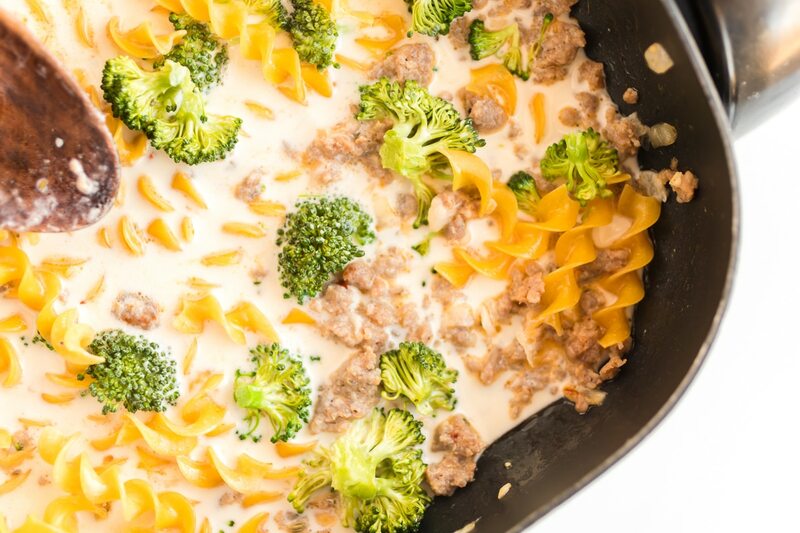 Creamy sausage and broccoli pasta combines the bold flavor of Italian sausage with broccoli and egg noodles, covered in a creamy sauce. Check out the step by step directions on how to prep and cook this easy recipe! 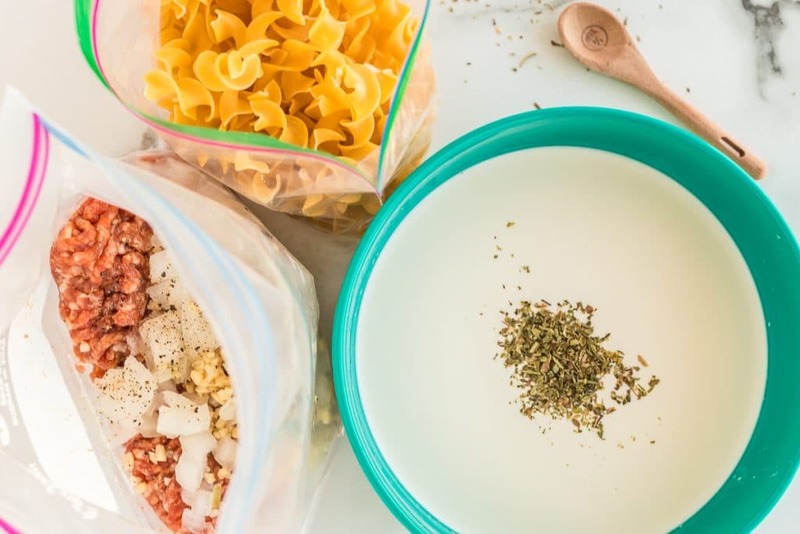 To prep the creamy sausage and broccoli pasta ahead of time, begin by adding the Italian sausage, onion, and garlic to a large zipper bag. You can substitute chicken Italian sausage, just be sure to remove it from the casing beforehand. Season with salt and pepper and zip up the bag. Next, in a container with a lid, prep the liquid part of the recipe. 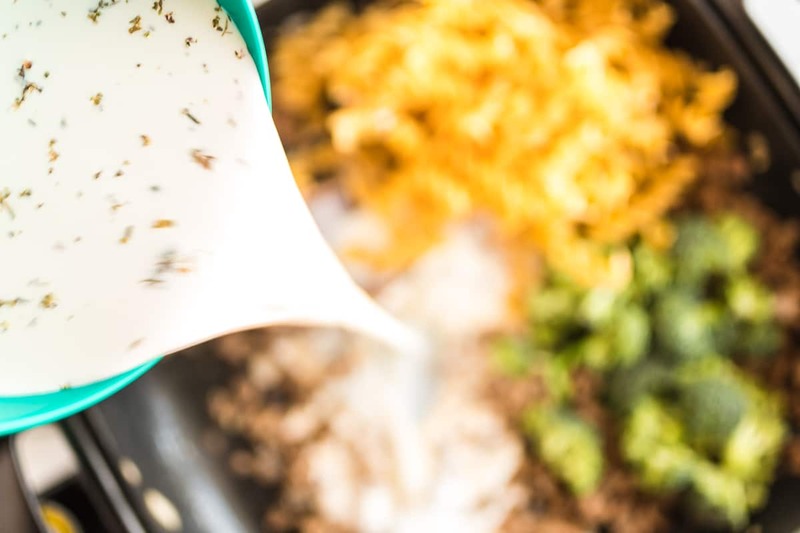 Add the heavy cream, chicken broth, and Italian seasoning to the container. Jazz it up with a pinch of salt and pepper. Lastly, go ahead and measure out the egg noodles and add to a separate bag or container. This step is optional, but it will make sure you are not hunting your pantry for the noodles on cooking day. 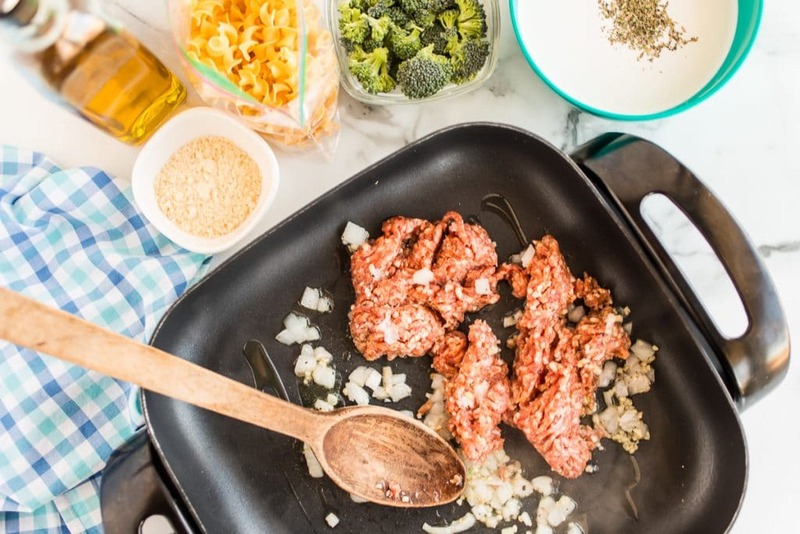 To begin cooking the creamy sausage and broccoli pasta, heat the oil in a large skillet over medium heat. Once the skillet is hot, add the Italian sausage mixture (from prep day). Cook until brown, breaking up the meat and stirring occasionally. After the sausage is browned, stir in the heavy cream mixture and then add the broccoli and egg noodles. Bring the mixture to a boil and cook for about 10-15 minutes, or until the pasta is tender. Once the pasta is cooked, turn off the burner and add parmesan cheese. If you are able, fresh parmesan cheese really does melt much better than the grated parmesan cheese in a can. Lastly, give the dish a taste and add more salt and pepper as needed. Creamy sausage and broccoli pasta – another tasty dinner, easy enough to make on a busy weeknight! Be sure to check out the 5 Dinners 1 Hour classic recipes for more prep ahead recipes that will make your weeknights a breeze! Try these other pasta recipes! Baked Zucchini Penne Pasta – This one pot pasta dish cooks up in the oven! Tortellini Primavera Pasta – Get your veggies in and satisfy your pasta craving!